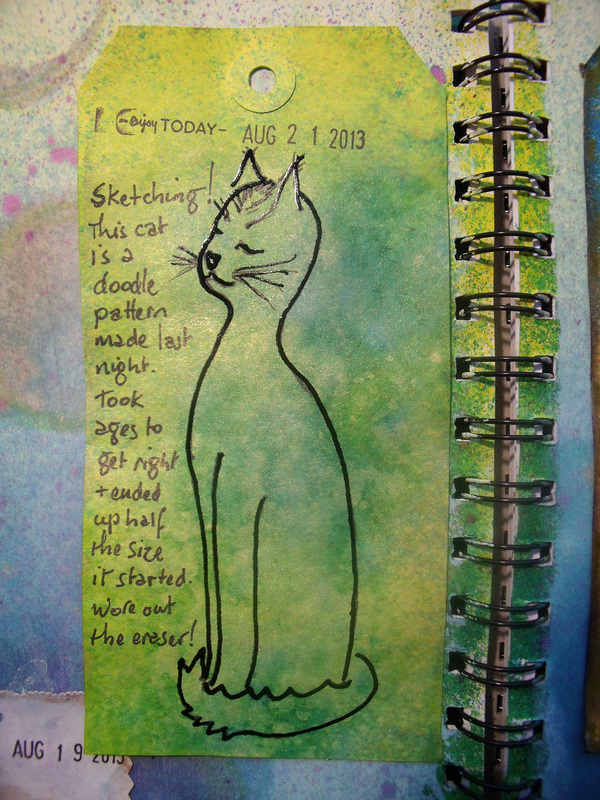 I’ve been posting about the on-line course I am doing in 10 minute journalling. It has been quite challenging for me and today I will tell how the challenges continue. Blimey – there’s a challenge! The theme was tags and other discarded ephemera, and the suggestion was made that something of interest pertaining to a particular day would also be incorporated. So I scuttled about in my drawer and two boxes and found some tags and also a piece of paper from which a heart had been cut. The background is Dylusions sprayed over gesso, which I discovered muted the colour palette right down. With a background of bluey-green splattered with yellow and pink and daubed at with a toilet paper roll dipped into brown paint, I worked within the daily 10 minute guidelines [well, mostly] and over four days journalled on some of the tags. I adorned one brightly coloured tag with the outline of my cat – which I’m quite enamoured with – and then included a note that says my blog hit 77 followers – which is a miracle to me – for the ‘item of interest’! 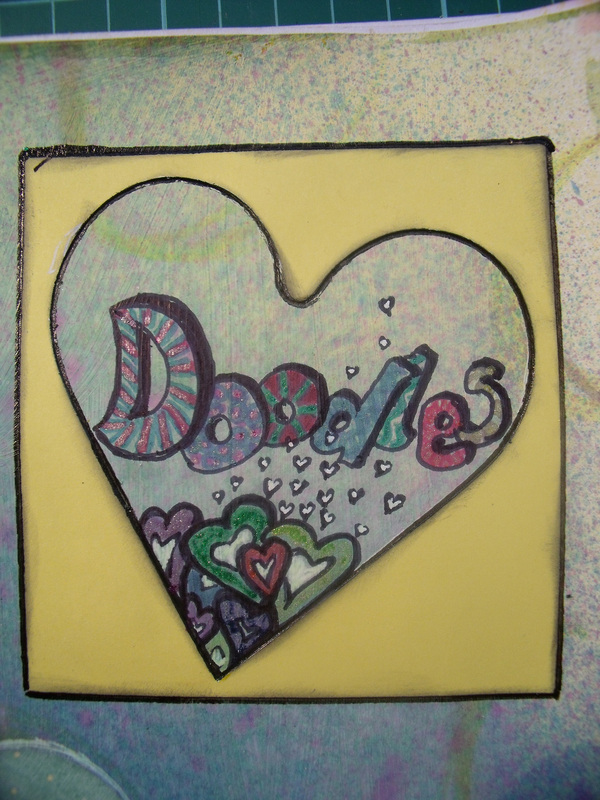 And finally, I faffed about with the open heart, writing ‘doodles’ inside it as that is my latest passion and that ended up taking much longer than the allotted 10 minutes! The scraps of left over paper I punched in my 1″ punch and made phases of the moon to accompany the note about the brightness of the full moon and the fact that Spring is coming!! 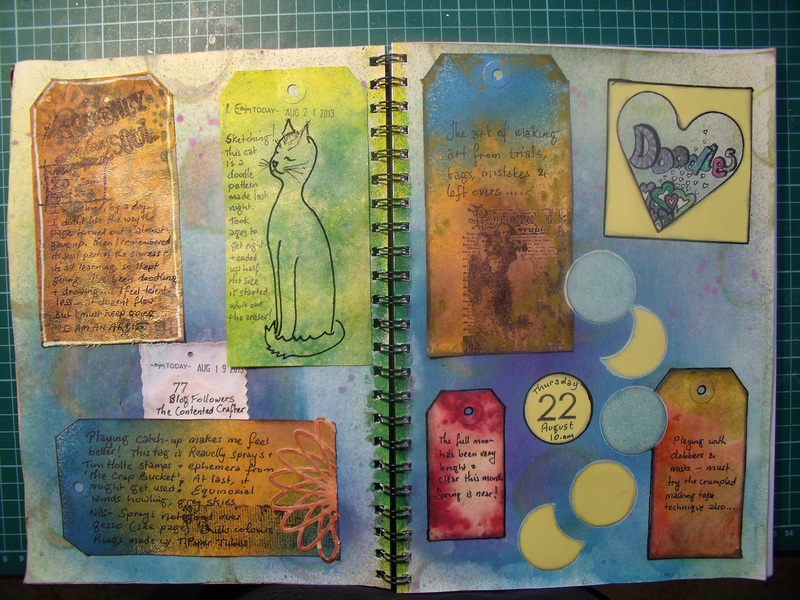 I have never made a journal page like this before – I probably never will again, but it is quite liberating to think you can go to the discard drawer and produce an interesting looking layout. Three close-ups to save your eyes a bit …..
And the negative left over from cutting out a heart die stuck directly onto the journal page and outlined with a glaze pen. 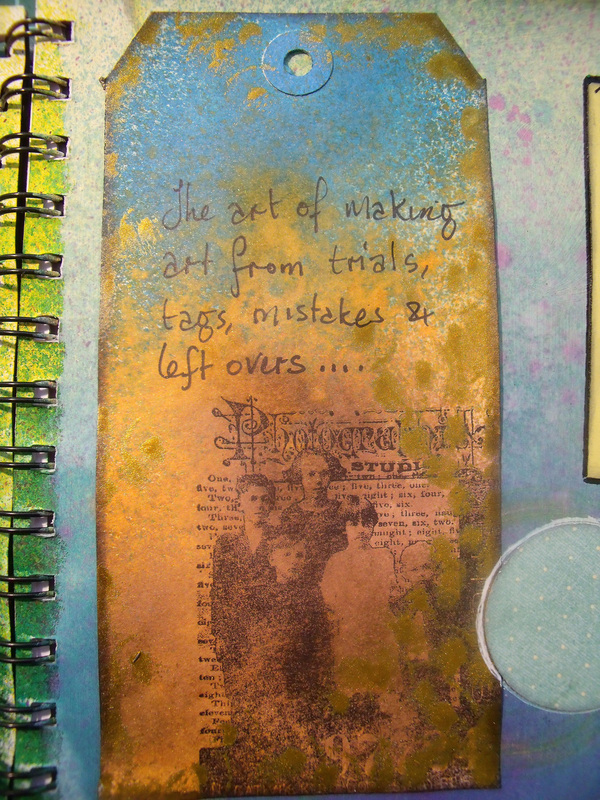 This entry was posted in Art Journal, Creations From My Craft Room, Creativity, Doodling and tagged art journal, challenges, Dylusions sprays, Tim Holtz by thecontentedcrafter. Bookmark the permalink. Tell Monty thank you – I think he is the dogs biscuit! Big hugs!! I think this is a fantastic way to journal when you have so much on your mind and can’t pin down one subject…great use of what would have been discarded. It’s totally hard for me to only use stuff I have. There’s always something new ‘I can’t live without’. Bravo for sticking to that challenge. I’m never going to be able to do anything in 10 minutes either, LOL. I’ve been working on something for over a week, off and on. I’ve changed it around many times….I think, “perfect”! But I wake up the next day and change something again. Cute kitty doodle too Pauline! It seems very organic to just use stuff you already have. I continue to say that you are super creative! I admire your patience and diligence in making your craft and works of art. I love the line , “we crafters never throw anything away” 🙂 You probably get the feeling that the moment you throw it out, you’ll need it for a project. This is wonderful. I love the challenge and what you’ve done with it. This page really speaks to me, too: the cat, the phases of the moon and the heart (I’m Organized at Heart). It’s really clever the way you doodled little hearts collecting in the corner of the larger one. Are you enjoying the process? Looks like great fun. Thank you for taking the time to look so carefully! I am starting to enjoy it more and more – as I get out of my own way! Every new page has me glaring at her-in-the-video saying things like ‘What? ?’ and ‘Why?’ and even ruder things – then I get on and do it and when it is finished think – oh, that is different, and even – well, that’s a good idea! I obviously need to take many more classes and get used to thinking outside the square! It’s so easy to do the same things. They’re familiar and comfortable. It’s amazing, though, what comes out when we set aside our resistance. Kudos to you for challenging yourself.